OXFORD, Miss. – University of Mississippi Chancellor Dan Jones announced a major campuswide commitment Tuesday (April 22) to the goal of making Ole Miss “climate neutral,” saying the university community is focused on making sure its operations will benefit the environment as much as they take away from it. 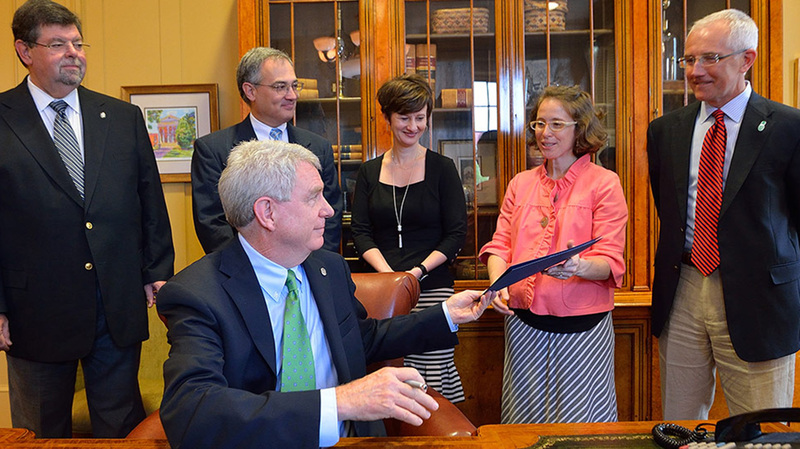 The announcement of UM’s renewed commitment to the environment came on Earth Day. Green Week also kicked off on campus Tuesday, bringing a weeklong focus on environmental issues and sustainability. Green Week culminates with an Arbor Day tree planting celebration among the many oaks in the Grove at 11:30 a.m. Friday (April 25). The chancellor also expressed his appreciation of the local landscape’s natural beauty and said he was grateful for the wisdom of state leaders in choosing the then-rural site for the campus, which opened in 1848. The picturesque surroundings inspire UM employees and students to strive for the goal of climate neutrality, he said. 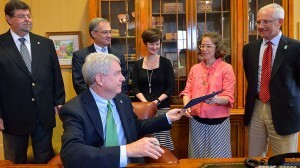 In April 2008, then-Chancellor Robert Khayat signed the American College and University Presidents’ Climate Commitment and two months later, the university established its Office of Sustainability. Jones thanked sustainability staff members who have kept the issue in the forefront at UM, including Banner and Anne McCauley, the office’s assistant director. Banner and McCauley thanked those who have been involved in the fight for sustainability. The chancellor also thanked poet and UM English professor Ann Fisher-Wirth, who directs the environmental studies minor and has been active in environmental issues. Fisher-Wirth said she sees the student body becoming more engaged in those issues. “I’m especially grateful for the leadership from the university and also for the students who are just increasingly active and outspoken and so mindful,” Fisher-Wirth said. The chancellor said the students have been one of the main driving forces behind UM’s commitment to climate neutrality.